Learn Web Development for FREE! Would you like to learn front-end web development so you can contribute to the Steem ecosystem? 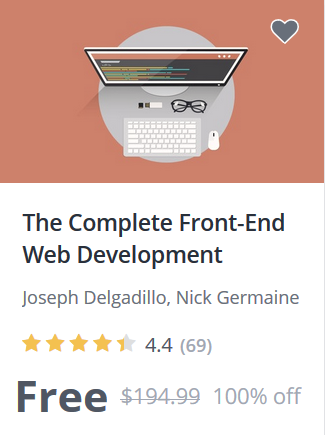 You can learn the essentials for FREE in my Udemy course! This course covers the most popular web development frameworks, and it will get you started on your path towards becoming a full-stack web developer! What a good course! Thanks! This post has received a 10.26 % upvote from @boomerang. You got a 29.44% upvote from @emperorofnaps courtesy of @jo3potato! This post has received a 4.58 % upvote from @booster thanks to: @jo3potato. Thanks. I joined. I've been looking for tutorials about developing for Steem. I haven't been too lucky. Will you be making any specficic classes about steem.js and similar scripts?